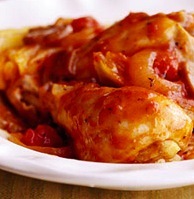 The men of your family will love this dish, the best of both worlds — spaghetti sauce and chicken! If desired, serve with hot cooked brown rice pasta (CORE Plan) or spiralized zucchini/yellow squash (ADVANCED Plan). We enjoy ours paired with a side salad. 1.) In a 6 quart slow cooker, combine cabbage wedges, onion, mushrooms and garlic. In a small bowl, stir together iced water with arrowroot powder until dissolved. Pour over vegetables in slow cooker. 2.) Place chicken pieces on vegetables. Sprinkle in seasonings (basil, oregano, sea salt, pepper). Pour spaghetti sauce and vegetable stock over chicken. 3.) Cover and cook on Low heat for 6 to 7 hours or on high-heat setting for 3 to 3-1/2 hours. Plate and sprinkle with Parmesan cheese just before serving.